This promotional card (measuring 3 by 4 inches) was given out by Dark Horse Comics to comic show attendees during the 1997 convention season. 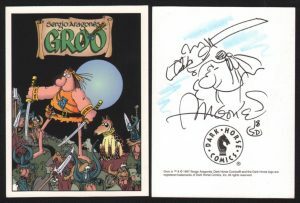 It is signed and features Groo with an original art sketch drawn by hand by Groo creator Sergio Aragonés on its reverse, blank side. It is in nm/mint condition and will be shipped with the utmost care. Please note- the sketch and signature are real. They are actually signed and drawn by hand by Aragones- they are not pre-printed images on the card.